Opened in 2010. Newly renovated in 2011. The Grand Bay View International (Haiwan Guoji Jiudian) is located in the new business district of Xiaguan in Dali, adjacent to the Gingang commercial area, the shore of Er River and Erhai Lake. The Hotel has a great location overlooking Erhai Lake and the Cangshan Mountains. Dali old town and airport are just 20 minutes away by car, and the railway and bus station is five minutes away. This Dali hotel is designed with a mix of European luxury and elegant modern styles. The hotel's grand ballroom can hold up to 500 people for a banquet or similar events. Chinese and Western cuisine, a la carte or VIP rooms are all served. A gym, indoor swimming pool, tennis court, spa, sauna, massage, and shopping centers are available. 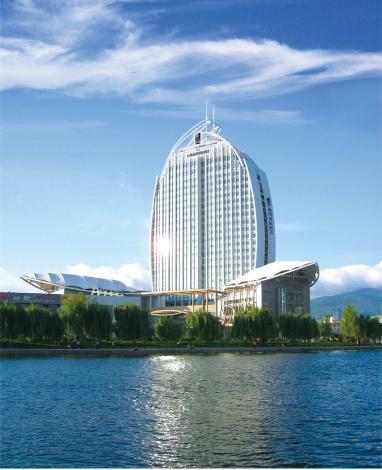 The Grand Bay View International is located in the new business district of Xiaguan in Dali, adjacent to the Gingang commercial area, the shore of Er River and Erhai Lake. The Hotel has a great position and overlooks the Erhai lake and Cang mountain. Within 20 minutes guests could reach Dali old town or airport, and the railway and bus station is five minutes away.